Jalex® Paper Towels are strong, absorbent and environmentally friendly. 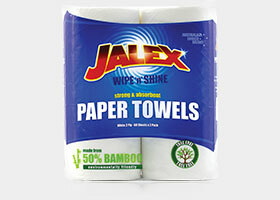 Made from 50% bamboo, Jalex® Paper Towels are also tree free and available in 2ply white. 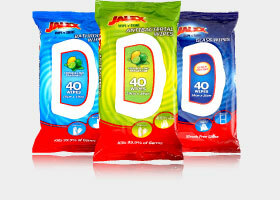 Jalex® Supreme Cloth Wipes are thicker, softer and more absorbent! 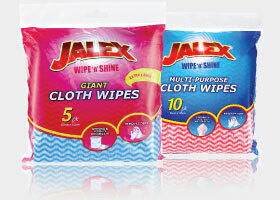 Made from 100% Viscose, Jalex® Supreme Cloth Wipes are strong, highly absorbent and easily remove dirt. The super thick open weave cloth enables for easy pickup of food and dirt, allowing for a quick rinse and ready to use again and again. are strong, highly absorbent and remove dirt easily. Range Includes: Cloth Wipes 10pk/30pk (60cm x 30cm) & Giant Cloth Wipes 5pk (60cm x 60cm). 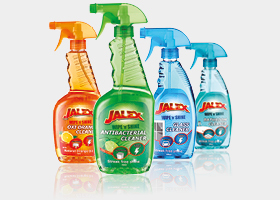 Jalex® Multi Purpose Sprays are designed to clean and deodorise your home free from mildew, stubborn stains and bacteria. The special powerful formula allows for a quick and convenient clean without the need to rinse. Jalex® Multi Purpose Sprays come with easy grip grooves, on/off trigger nozzle and are available in 750ml and 500ml fresh scented varieties. Jalex® Wipe ‘n’ Shine™ pre-moistened Wipes are specially designed to help keep your home clean, neat and fresh. The resealable snap lock pouch makes for ease of use, is quick and convenient and ensures you find a fresh and moist wipe every time. With Jalex® Wipe ‘n’ Shine™ Wipes, you can quickly and effectively leave your home cleaner in one easy step. Antibacterial Sponges are ideal for use in the kitchen, bathroom, laundry and bench tops. 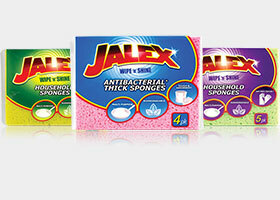 Manufactured using a biodegradable material, Jalex® helps take care of the home and environment. Range includes: Thick Sponges 4pk, Household Sponges 3pk & 5pk. 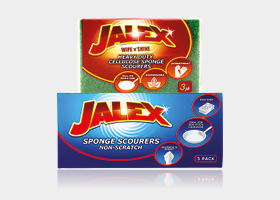 Jalex® Sponge Scourers are powerful and robust to make light work of tough cleaning jobs. Ergonomically designed with easy grip hand grooves and nail guards, Jalex® Sponge Scourers are available in Heavy Duty and Non Scratch varieties. Range includes: Non Scratch 3pk, Heavy Duty Cellulose Sponge 3pk. 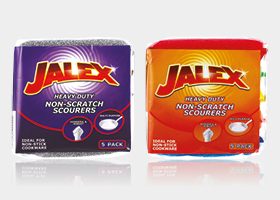 Jalex® heavy duty scrub scourer and restore surfaces back to new.